The three men were released around 10pm last night, with no reports of abuse by the boys while in Israeli custody. 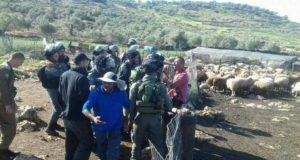 RAFAT, SALFIT – Three young men from the village of Rafat were arrested today by the Israeli Forces following a nonviolent demonstration on their land. At 12:44 p.m., the men—ages 16, 20, and 24—were detained on the road by eight soldiers who were checking IDs. At 1:15 p.m., the men were handcuffed and escorted by five soldiers to five jeeps. The men were taken away in separate jeeps at 1:30 p.m.
150 people joined the demonstration in Rafat as part of the Stop the Wall campaign to commemorate the 31st Land Day celebration in Palestine. Participants marched westward from the center of town towards the Israeli Apartheid Wall. 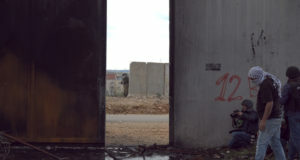 One group of men prayed, while another group of 30 men approached the Wall (made of wire fence, electric sensory wire, and razor wire), broke open a gate, and tore down part of the Wall before Israeli forces arrived on the scene at around 12:15 p.m. All participants retreated to the village and there was no confrontation or clashes with Israeli soldiers during the demonstration. As they were leaving the village after the demonstration, seven participants were detained by soldiers for 30 minutes near the center of town, including Medical volunteers in an ambulance and the three men who were later arrested. The three young men were detained as they passed the jeeps on their way home. Soldiers gave no reason for the detention or the arrest and refused to disclose information to human rights advocates. As of 9 p.m., the three men had not been released. Since 1976, Land Day is marked by Palestinians to protest against the the colonization and confiscation of Palestinian lands by Israel. Rafat is adjacent to the 27-settlement bloc of Ariel, the largest Israeli settlement network in the West Bank. 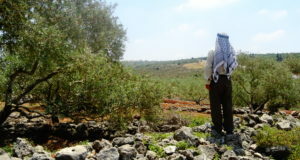 The Wall around the Ariel bloc stretches for 114 km and grabs within it 120,000 dunums of prime aquifer-laden agricultural land which produce about 30 percent of the West Bank’s olive oil production. The Apartheid Wall dips farthest from the Green Line here and deep into the West Bank by about 22 kilometers.